Change the bit rate of your mp3 files in a really simple but intuitive way so that the file size can be dramatically reduced while the audio quality stays the same. Even advanced tasks are possible Downsampling, changing the used channels and so on. Features: This utility that is distributed as a small executable helps modify the quality of the audio track and thereby lets you modify the file size. It is free, small and portable. The program helps you change the bit-rate. The effect on the file size is quite significant. You are thus able to store more music whether on your PCs local disk or on the music player that you use. It is easy to make these changes in just a few clicks through the easy and intuitive interface. ID3 tag information of the original files are retained including title, artists etc. Date of the original recording also can be retained. Some of the advanced features include down-sampling, changing the channels used and so on. You have options such as detailed variable bit rate mode, sample frequency and so on. The interface lets you tune a lot of parameters. But using it is easy. Quality comparison, changes in the quality and the file size is easily done. Quality modification progress is monitored through the progress bars. The details can be viewed through the status display. You clearly see the percentage change and the generated file size on a display area. Overall: An easy and handy tool. But with the current situation of huge storages being available easily reducing quality of a track to reduce the file size may not be very attractive. 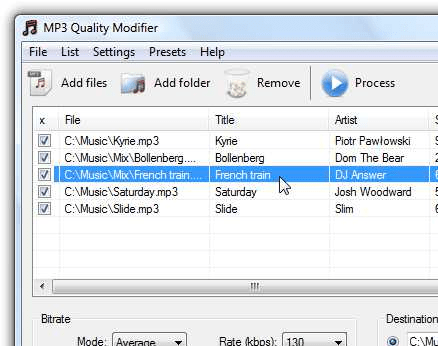 Use MP3 Quality Modifier for quick and easy quality edits of your music files - It's uncomplicated, portable and free! MP3 Quality Modifier is a straightforward program that is able to easily change the quality of your MP3's in order to save disk space and/or to fit more music on your MP3 player while maintaining the desired level of audio quality and keeping all ID3 tags intact! MP3 Quality Modifier is portable, doesn't need an installation and is powerful but easy to understand! Easy and great working tool for compressing my MP3`s! !